Paperback 195 mm x 128 mm (7 ¾ in x 5 in), 224 pages. Distributed by Tower Books, Unit 2/17 Rodborough Road, Frenchs Forest NSW 2086, Australia. Ph 61 2 9975 5566, fax 61 2 9975 5599. Bill and Michelle win the Australian Science Fiction Award for Best Collected Work for The Year's Best Australian SF & Fantasy, Two. Bill wins the Australian Science Fiction Award for Professional Achievement for MirrorDanse Books and The Year's Best Australian anthology series. The critically acclaimed anthology series returns. These are our futures, our pasts and our worlds that might have been: a soldier seeks to escape a never-ending war; the Ash-Mouth Man peers in at his victims in a hospital ward; a young biologist discovers the truth of natural selection in the jungles of the Amazon; a businessman seeks unnatural revenge by a lonely rail track; blackbirds devour the souls of dead soldiers; a tribe of refugees face life amid the hostile ruins of Canberra. Provoking and inventive, the Year's Best Australian Science Fiction & Fantasy, Third Annual Volume includes talented newcomers as well as established professionals at the peak of their form. 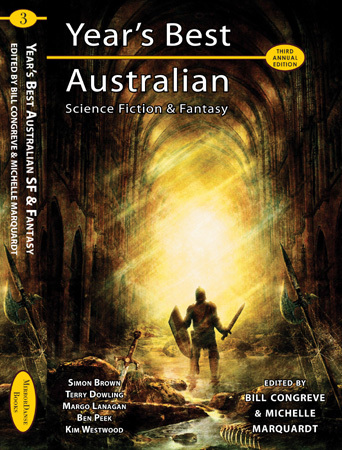 Includes an overview of the genre, a list of markets for writers, sources of Australian SF and fantasy, and recommended reading. Bill Congreve: One of Australia's most experienced speculative genre editors and publishers, with anthologies such as Southern Blood shortlisted for awards world-wide. He has won numerous awards for editing and publishing SF and horror. His vampire stories have been collected as Epiphanies of Blood. Michelle Marquardt: Has an honours degree in veterinary science. She is the author of the George Turner prize-winning novel, Blue Silence, which was also shortlisted for both the Aurealis and Ditmar awards. Tomislav Tikulin: Tomislav was born in Zagreb, Croatia. He began his career as a graphic designer and comic colorist. He was also the chief 2D artist on a computer point and click adventure. He then began working on digital illustrations, mainly for book covers, but also posters, DVD jackets, and production design illustrations. Science fiction and fantasy are his main interests, and he now works freelance for a number of magazine and book publishers in Europe, the USA and around the world. Simon Brown: Simon is one of Australia's leading fantasy authors, with trilogies from Harper Collins and Pan Macmillan, both of which have been reprinted in the US. His most recent book is Troy, a collection inspired by the histories and myths of Troy. His most recent fantasy novel is Daughter of Independence, the final novel of the Chronicles of Kydan trilogy. Kaaron Warren: Kaaron's short story collection, The Grinding House, won the ACT Writer's and Publisher's Fiction Award, and will be published in North America by Prime Books. Margo Lanagan: Margo' collection of speculative fiction short stories, Black Juice (Allen & Unwin Australia 2004, HarperCollins US 2005, Orion 2006), won two World Fantasy Awards, a Victorian Premier's Award, two Ditmars and two Aurealis Awards. Her short story 'Singing My Sister Down' was shortlisted for many other awards, including the Bram Stoker, the Theodore Sturgeon, an International Horror Guild Award, a Nebula and a Hugo. Her third collection, Red Spikes, was published in Australia in October 2006, and won the Children's Book Council: Book of the Year, Older Readers award. Margo lives in Sydney. She has just completed a fantasy novel. Geoffrey Maloney: Geoffrey has had over seventy short stories published in anthologies and magazines in Australia, the US and the UK. He grew up in Sydney but now lives in Brisbane with his wife and three daughters. A collection of his short stories, Tales from the Crypto-System is available from Prime Books in the US. Terry Dowling: Terry Dowling is one of Australia's most awarded and versatile writers of science fiction, fantasy and horror. He is author of nine books, among them the award-winning Tom Rynosseros saga and the critically praised collections Blackwater Days and Basic Black: Tales of Appropriate Fear (which recently won the International Horror Guild award for best collection. He has also authored three computer adventures. Terry's stories have appeared in The Year's Best Science Fiction, The Year's Best SF, The Year's Best Fantasy, The Best New Horror and many times in The Year's Best Fantasy and Horror, as well as in anthologies as diverse as Dreaming Down Under, Centaurus, Dark Alchemy and The Dark. Holding a doctorate in Creative Writing, he is also editor of Mortal Fire: Best Australian SF, The Essential Ellison and The Jack Vance Treasury, and has been genre reviewer for The Weekend Australian for the past eighteen years. Deborah Biancotti: Deborah's first published story won the Aurealis Award for Best Horror Short. She's also a Ditmar Award winner and a previous attendee in both the Year's Best Australian SF & Fantasy and Australian Dark Fantasy & Horror. Her work has appeared in Eidolon 1, Ideomancer, Orb, Borderlands, Shadowed Realms, infinity plus, and publications from Ticonderoga and Agog! Deborah lives and works in Sydney. Lee Battersby: Lee is the award winning author of over fifty stories, including appearances in Writers of The Future Volume 18; All-Star Zeppelin Adventure Stories; and the upcoming Year's Best Fantasy & Horror Twentieth Annual Collection. A collection of his work, Through Soft Air, was released by Prime Books in 2006. Lee lives in Clarkson, Western Australia, with his wife, writer Lyn Battersby, as well as a gaggle of children and far too many weird things for his own good. He is far too attached to Daleks. You can find out more, including all sorts of lies, at the Batthome. Ben Peek: Ben is a Sydney based author. He is the author of the semi-autobiographical novel Twenty-Six Lies/One Truth, and the dystopian novel, Black Sheep, while his short fiction has appeared in the Polyphony, Leviathan, and Agog! anthology series, as well as Fantasy Magazine, Aurealis, and Phantom. Chris Lawson: Chris is a doctor and writer. His award-winning fiction has appeared in Eidolon magazine, as well as Asimov's Science Fiction, Event Horizon, Dreaming Down-Under, Gathering the Bones, Agog!, Realms of Fantasy and Spectrum, and has been collected in several Year's Best science fiction anthologies and the Australian retrospective Centaurus. His stories have been translated into French, Bulgarian and Czech and one has been optioned for feature film adaptation. He has written non-fiction for journals such as Borderlands and Ticonderoga Online. A collection of his stories and essays, Written in Blood, was published in 2003 by MirrorDanse Books. Most of his work is drawn from cutting edge biotechnology, although he sometimes lapses into fantasy and horror. Kim Westwood: Kim won a 2002 Aurealis Award for her first speculative fiction story, 'The Oracle', published in Redsine 9 then translated for Znak Sagite, a Serbian specfic magazine. Seven more stories have appeared since, in anthologies such as Agog! and Eidolon I, various Year's Bests in Australia and the USA, and on ABC Radio National. 'Terning tha Weel' was also shortlisted for an Aurealis Award. She lives in Canberra with her partner, her dog and her novel, the last of which she took on retreat, thanks to a Varuna Writer's Fellowship. She has signed with HarperCollins for it to be published in 2008. Alistair Ong: Alistair has had short stories published in Chelsea in New York and Aurealis and Eidolon in Australia, and has also had a short play produced in Los Angeles. He is a graduate of the Clarion Writers' Workshop in Michigan, the TropNest Script Initiative at Fox Studios Australia, and the Master of Fine Arts program at Sarah Lawrence College in New York. He is currently teaching creative writing at LaTrobe University and NMIT in Melbourne, Australia, and completing his first novel, Bamboo and Red Envelopes. Excerpts from the novel will be published in Meridian Volume 19 Number 1, and in Uninvited, by Flat Chat Press, in October 2007.